On Tuesday, General Attorney Jeff Sessions testified in front of the Senate Intelligence Committee about his ties (or supposed lack thereof) to Russia. Can you believe this is our new normal? Ronald Reagan is probably rolling in his grave. Anyway, Senator Kamala Harris (D-CA) grilled Attorney General Jeff Sessions over his refusal to answer questions concerning conversations he may have had with President Donald Trump during his campaign and presidency. She was eventually interrupted by Republican Senator John McCain of Arizona and Committee Chair Richard Burr. This is not the first time McCain has interrupted Harris. Although her directness was praised by some, it was criticized by others. 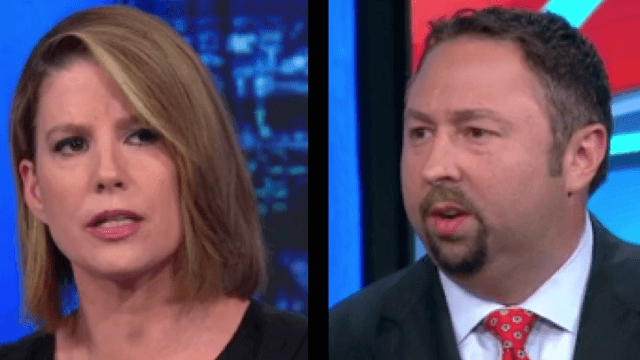 One critic of Senator Harris was Jason Miller, a former Trump aide who is now one of the president's in-house surrogates at CNN. On Anderson Cooper 360 on Tuesday, Miller accused Harris of "hysteria" for her aggressive line of questioning during Sessions' testimony. Political analyst Kirsten Powers was quick to fire back at this choice of words. "How was Senator Harris 'hysterical?'" she asked Miller. "From my perspective ― my, I would say, objective perspective ― I mean it was ... it didn’t seem like there was any effort to try to get to a real question or get to the bottom of it," responded Miller. The answer was not doing it for Powers. "I think she asked a lot of questions, actually. She was very dogged, there’s no question, but I wouldn’t say she was any more dogged than Ron Wyden [Democratic Senator from Oregon] was, would you? Would you say that?" "I think she was hysterical," Miller said. "I don't think Sen. Wyden was trying to get to the bottom of answers either." Hm, not her point, dude. Another CNN Trump surrogate, Jeffrey Lord, also added his two cents by saying, "hysteria is a neutral quality." Yeah, just like the words "shrill" and "catty" are also "neutral." According to The Huffington Post, the word "hysteria" has historically been used to dismiss women going back to the word’s Greek root, which means "uterus." Merriam-Webster dictionary writer Kory Stamper also gave a little more historical context as to why this word could be perceived as sexist. A quick corpus search for the top 500 collocates of "hysterical" yields 27 words that are female & all near the top in frequency. 2/? There are _TWO_ words that are male, and they are at the very bottom: "spokesman" and "Duncan" (and I'm being generous with Duncan). FURTHER, the top non-female collocates--"laughter," "shrieks," "cries," etc.--are used 99% of the time of female subjects. 4/? "Hysterical" connotes illness: word's from the Greek word for "womb" & notion that women's neuroses were caused by uterine disturbances. 5/? Speaking of, has anyone ever called this man 'hysterical'? Because he seems pretty hysterical.